January is always an interesting time of the year as we review and reflect on our procedure numbers from the previous 12 months. I was both amazed and intrigued to have injected 1,761 syringes of filler in the past 12 months. I knew I was in the top 10% of injectors nationally, but did not ever really count the volume in the past as we mostly tracked surgical procedures. What is also notable is that I personally do all filler and neurotoxin injections in my office. Some practices have multiple physician injectors or non-surgical staff such as nurses and nurse practitioners that may inject. In our office it is just me, so 1,761 syringes of filler means I was really busy. In further reflecting about the popularity of injectable fillers, so much has changed in 15 years. For those of us that were using fillers in the 1990’s, the choices were pretty slim. Basically we had Zyderm and Zyplast which was collagen from cow tissue. One big draw back was that some patients could have severe allergic problems and when mad cow disease surfaced, it upped the scare factor for animal collagen. Allergy was rare, but allergy testing was a hassle because the patient had to come in a month before injection to have a test dose to determine allergic response. Hard to imagine now in this day of “walk in/get injected” treatment. The other and biggest problem of collagen filler was that it simply did not last. It did OK for fine lines and wrinkles but sometimes only lasted a matter of weeks. It was also pretty “creamy” in texture and did not do much for lifting or plumping. Fast forward 10 years and NASHA fillers were introduced. This stands for Non Animal Stabilized Hyaluronic Acid. Hyaluronic acid is a naturally occurring carbohydrate that is found in many body tissues. It has the consistency of hair gel and can be produced in thin and thick formulations. The thinner (more watery) formulation (Restylane, Juvederm Ultra, Belotero) are used more for fine lines and wrinkles or outlining lips. The thicker formulations (Perlane, Juvederm Ultra Plus, Voluma) are well suited for more robust applications like lifting or volume restorations, such as filling cheeks and smile lines. If you desire more trivia, this viscosity or adhesivity is referred to as “G Prime”. These hyaluronic acid fillers have been game changers because there are no allergy problems, and the results last for up to a year. Another huge advantage of the hyaluronic acid fillers is the fact that they can be reversed overnight. Although most patients want their filler to hang around, there are times where they may not like the result. 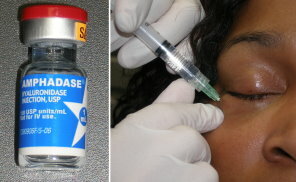 Injecting hyaluronidase (an enzyme that dissolves the filler) can reverse the result in a matter of hours. That can be a great insurance policy. Although we have semi-permanent and permanent fillers, they cannot be reversed and permanent filler can turn into a permanent complication. I personally inject Radiesse and fat which are semi-permanent filler and silicone oil which is permanent filler. Where and how we use these types of fillers is different from every day filler applications. 95% of patients are best suited for hyaluronic acid fillers. Finally, the other reflection about fillers is how our usage has changed over the past 15 years. I can promise you that no one ever walked into my office in the mid 1990’s and asked for cheek, teartrough, or brow filler. In one respect, we did not think about it and in the other respect, it would not have worked well with the available products at that time. Today, we use fillers in the upper face for forehead lines, eyebrow lift, and crow’s feet wrinkles. We use them in the midface for teartrough, cheek, smile line and nose treatment, we use them in the lower face for lip, chin, jowl, mandibular angle and jawline augmentation. The versatility of modern fillers has been both exponential and amazing and is truly an enjoyable part of my practice. I routinely publish on filler use and technique and teach courses major filler companies to train other doctors. I love performing surgery, but I also enjoy the artistry and sculpting that involves injectable fillers. This is one of the reasons my job is so much fun. Belotero is the newest FDA injectable filler available in the USA. It has been used for years in Europe with excellent patient satisfaction and safety margin. This filler is unique in several ways. Most notably, it is made with a dual cross linking process that gives it some of its unique properties. The biggest advantage with Belotero is that it can be injected very superficially for fine lines and wrinkles. This is important as many other fillers are too thick (honey like) to be injected in the very superficial dermis and when this is done, it can leave a thickened line. Belotero, on the other hand is engineered specifically for superficial injection. I must say that when I began using it for fine lines and wrinkles it was hard to believe how superficial it could be injected. Having said that, it can also be used like conventional fillers for deep wrinkles and lips. I think the biggest innovation is that the company states that due to the Belotero’s particle properties, it does not cause a Tyndall effect when injecting in the tear trough region. The Tyndall effect (in this case) is when a clear product is injected under the skin and produces a bluish hue due to the way the light is reflected. Although harmless, it produces dusky skin that can make a patient look older, as in dark circles. To avoid this, most fillers are injected deep on the bone in the tear trough region. 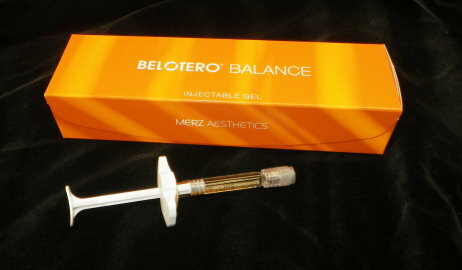 Belotero, however, due to its unique composition, can be injected much more superficially which gives the doctor more control of improving wrinkles and rejuvenating this region. I have been using Belotero and so far have found it to live up to the claims of the company. I will keep my blog updated on this topic. Click here to see a video of Dr. Niamtu injecting Belotero. Cosmetic Injectable Fillers Can Kill You: The wrong filler in the wrong hands. You have to wonder what people are thinking when they agree to be injected by lay personnel. Lately, the news has featured several high profile cases where patients sustained serious health problems and even death after injection of industrial substances instead of approved soft tissue fillers. You may think it is because of the lower fee, but the case detailed below cost the patient $4,000 and maybe her life. Medical or surgical treatments should only be performed in a clinic environment by experienced personnel; never in a hotel room, “filler party” or someone’s home. The cases detailed below involve silicone purchased from a home improvement store and flat fixer from an auto parts store. Cement was also used in the second case, but we are not told what type of cement. Injecting anything into your body is serious stuff people and it can kill you. Medical grade silicone is FDA approved and used off label to plump lips and wrinkles and is one of my favorite fillers. I have been safely injecting silicone in patients for a decade and follow very strict principles of treatment and remain very conservative. Silicone is a very good and safe filler when used by experienced injectors. It is permanent filler which is a good thing, as long as it is done correctly. Otherwise it is a permanent complication! No patient should ever allow any non-healthcare personnel to inject any filler anywhere in their body and when using doctors or nurses, do your homework. Make sure that the person injecting you is experienced. He or she should be able to show you many before and after pictures of their work. 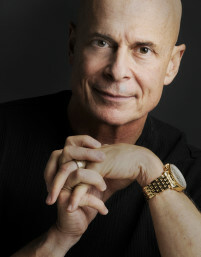 Doctors that lecture or publish on fillers are generally the most experienced. Don’t risk your life for an alleged “bargin”. Baltimore — The Food and Drug Administration and other health agencies are investigating incidents across the country in which unlicensed, untrained practitioners are performing cosmetic procedures with supplies that may have been purchased in home improvement stores. A Baltimore exotic dancer injected with silicone to enhance her buttocks has become another victim in a growing trend that has led to illnesses, injury and even deaths, the Baltimore Sun reports. An FDA affidavit contained in court documents identified the woman who injected the unnamed dancer as Kimberly D. Smedley, 45, of Atlanta. Ms. Smedley was arrested in Washington in October with three 18-gauge medical needles found among her belongings. The case remains sealed, and the specific charges are unknown, the Sun reports. The dancer was hospitalized twice less than four days after the last of her injections in March, according to court documents. On her second visit she was given blood thinners to alleviate clots, and she remained hospitalized for 10 days. A CT scan showed silicone in her lungs, where it remains. Court records state that the silicone Ms. Smedley allegedly injected into the dancer came from an unlabeled jug that may have been purchased at a home improvement store, where it is sold as caulk and other adhesives, according to the Sun. The dancer paid $1,000 for each of four sets of injections after meeting Ms. Smedley in the club where the dancer worked. She told authorities that Ms. Smedley also injected silicone into other dancers in a downtown Baltimore hotel, the Sun reports. In similar incidents, a woman was arrested in Miami recently after allegedly injecting a woman with tire-repair liquid to enhance her buttocks, and earlier this year a British woman died after an improper procedure in a Philadelphia hotel room, according to the Sun. A New York City woman also was arrested on charges that she performed illegal breast- and buttocks-enhancement procedures in her home, according to news reports. A lot of attention gets paid to lip enlargement but there are a large number of patients that aren’t interested! Contemporary cosmetic surgeons and practitioners are well aware of the art and science of lip enhancement using injectable fillers. For those of us who have been doing this longer than 10 years, we remember the old days of bovine collagen. That was a tough time for fillers as we basically had two choices; Zyplast and Zyderm. Allergy testing and minimal longevity made this a less than desirable option. Fast forward to 2002 and the first hyaluronic acid fillers received FDA approval. This began a filler revolution that gave cosmetic injectors a non allergenic product that did not require over correction, was much longer lasting and (of utmost importance) could be reversed. These hyaluronic acid fillers have become the dominating force in contemporary lip enhancement. Numerous other types of injectable fillers have also been FDA approved providing the cosmetic surgeon with numerous safe, and long-lasting options. Although filler injection is one of the most commonly requested cosmetic procedures, not all patients can benefit from larger or fuller lips. Some patients (primarily ethnic patients) request smaller lips and other patients have congenital or age related morphologic conditions that require more than a simple filler injection to improve. The remainder of this article will deal with several surgical solutions to accommodate this segment of the cosmetic surgery population. Astute cosmetic practitioners realize that all lips are not created equal and in fact they are probably more like snowflakes in that no two patients present with the exact same situation for correction. The youthful lip has many unique characteristics. These include volume that provides plumpness, a shorter length than the aging lip which provides pout and allows for several millimeters of upper incisor show. In addition, the aesthetic youthful lip displays well defined anatomic structures that include the “white roll” which is the light reflex at the vermilion/cutaneous junction of Cupid’s Bow (figure 1A). A well developed Cupid’s Bow that generally has a “lazy M” shape in the upper lip. The lower lip vermilion/cutaneous junction is more curvilinear. Other desirable features include a well defined philtrum and philtral columns. 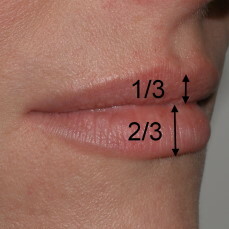 The upper lip is consistent with the Golden Ratio (also called Devine Proportion) ratio of 1:1.6, which means that the upper lip contains about 1/3 of the total lip volume while the lower lip contains about 2/3’s of the total lip volume (figure 2). Figure 1. This image shows the volume and form of the youthful lip (left) versus the loss thereof in the senescent lip (right). Figure 2. This image illustrates the aesthetic anatomy of female lip. The senescent lip undergoes many changes when compared to the youthful lip. A generalized loss of volume occurs that affects all associated tissues. The lip skin is affected from actinic damage and vertical lip rhytids, the lip muscle, fat and salivary glands also becomes atrophic. The supporting teeth and alveolar bone also undergo atrophic changes which lead to decreased lip position and support. The sum of all of these changes results in a longer lip in older individuals (figure1B) with loss of volume and definition. The longer lip also hides the upper incisor show. The subcutaneous lip lift (SLL) is designed to shorten the lip as well as “roll it out and up” to restore volume and extend vermilion and upper incisor show. Candidates for this procedure must have a lip length of at least 20 mm from the columella to the vermilion, as shortening a lip that is already short can lead to anaesthetic results that are difficult to correct. Using a fine line marker, a very geometric line is drawn at the base of the columella, moving laterally along the bilateral alar bases. These lines should represent the full anatomic curvature of the nasal base structures. Next, a reciprocal line is drawn to complete the “bull horn” or “mustache” anatomy. The lower portion of the incision is 5-7 mm from the top line in the average patient and tapers into the alar bases (figure 3). Figure 3. The subcutaneous lip lift is sometimes referred to as the “bull horn” procedure because of the geometric outline of the excess upper lip skin below the nasal sill. Local anesthesia is injected subcutaneously around the marked incision and using a 15 scalpel blade, the incision is made, keeping in mind the curvature of the incision. 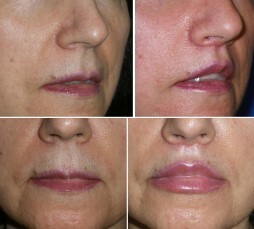 The incision can include skin or skin and orbicularis muscle depending upon how much outward roll our pout is desired. If muscle is included, the incision can be “V” shaped in cross-section. The marked skin is then excised and cauterization performed for hemostasis (figure 4). Subcutaneous 5-0 gut sutures are used to reinforce the closure and a running 6-0 nylon suture is used for final closure (figure 5). 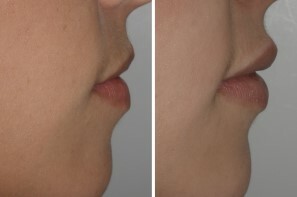 A patient is shown before and after subcutaneous lip lift (figure 6). Notice the difference between the length and pout of the lip as well as the amount of incisor show in the after picture. Figure 4. 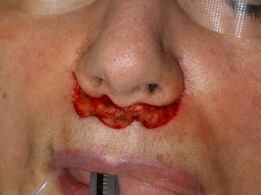 The excised upper lip excess is shown in this figure after hemostasis. Figure 5. The final 6-0 nylon suture closure is shown one week after the procedure. Figure 6. 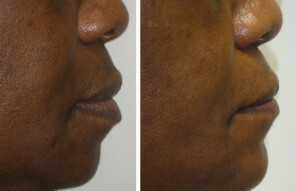 This patient is shown before and after subcutaneous lip lift. Not the shorter and fuller lip. The patient also has more upper tooth. As stated earlier, not all patients desire larger lips. In my personal experience it is mostly African-American patients that seek lip reduction although I have performed the procedure on Caucasian patients. The lip lift procedure is designed to reduce the amount of vermilion show and outward roll of the lips by removing a strip of mucosa and or muscle posterior to the wet/dry line. Patients that have significant class II occlusion (buck teeth) or significant incisor show are not candidates, as this procedure also shortens the lip and excess tooth show would be a complication. Like many procedures, pre op markings are very important to control the result of the procedure. The patient is marked by estimating the amount of excess or desired reduction. The patient is asked to retract their lips while looking the mirror to the point of reduction desired. The lips should be wiped with alcohol before marking to all better adherence of the marking. A mark is made at this position on the lips (figure 7A). Next, the patient is asked to relax their lips and a mark is made on the vermilion at this point (figure 7B). The difference between the marks (usually 5-7 mm) is the amount of anticipated reduction (figure 7C). This reduction will be completed posterior to the wet/dry line. For the novice surgeon it is better to error on the conservative side as more reduction can always be completed later. After marking the lips, a dry gauze is placed between the lips to prevent markings from smudging. Figure 7. The patient is shown with lips relaxed (A), the lips pursed (B) and the differences between these positions (C). This is used to estimate the amount of skin to be removed posterior to the wet/dry line. Important to the success of the procedure is making the incision posterior to the wet/dry line to keep it hidden. Failure to do so will produce a visible incision. The lips are infiltrated with local anesthesia in all planes. 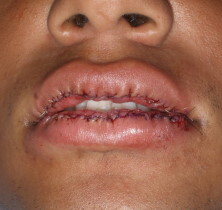 Due to the vascularity of the lips, a simultaneous incision/coagulation such as electrosurgery, radiowave surgery, or CO2 laser is preferable (figure 8). Figure 8. This image shows the Ellman high frequency radiowave micro needle used to incise the lip (8A) and used in the coagulation mode to excise the excess mucosa with simultaneous hemostasis. Experienced surgeons will often remove 1.5 to 2.0 times the estimated skin. If the pre op markings require a 5 mm position difference, 10-12 mm of skin is removed to compensate for the elasticity of these tissues. This should be approached with caution by novice surgeons. After the skin is excised, the orbicularis oris muscle and minor salivary glands are visible. For patients that desire significant reduction it is not uncommon to remove a wedge of these deeper tissues. After the proper amount of mucosa and deep tissue is removed, absolute hemostasis is performed and several 5-0 gut key sutures are placed to strengthen the closure. This is followed by a running 5-0 silk suture (figure 9). Although other suture materials can be used, silk is the most patient friendly. Figure 9. The final closure with 5-0 silk running suture is shown. This procedure is always followed by significant swelling and patients are frequently placed on a steroid regimen. The suture line may initially be visible due to the swelling, but will retract as swelling resolves. Patients must be warned that in some cases swelling can last for a number of weeks. Figure 10 shows a patient before and after lip reduction. Figure 10. This patient is shown before and after surgical lip reduction of the upper and lower lips. Up till about 5 years ago, lip implants were a common procedure in my practice. Due to the advances in HA fillers, the procedure has waned, but is still an option for some patients. Although most cosmetic patients have accepted the process of injectable fillers, there is a segment that disdains needles or the need for continual maintenance. Lip implants can be a suitable option for this segment of the cosmetic population. Contraindications for this procedure include smokers or patients that use their lips to make a living (woodwind instrument players). Patients must understand that the implant may be visible with extreme animation and that it will also be palpable. I have used numerous materials over the years for lip implantation and although several of these are biocompatible, they do not look or feel natural. At this point in time, the only lip implant I use is a soft, stretchy, tapered implant made by SurgiSil (Plano, TX). The patient’s lips are measured pre op to determine the proper implant size. This procedure is easily performed with local anesthesia which is infiltrated in all planes of the lip. A “stab” incision is made just shy of each commissure and a dissector is advanced through one incision and out the other incision (figure 11). Figure 11. A tendon passer is threaded through stab incisions in the center of the lip and the implant is pulled through the central lip into position. Figure 12. This patient is shown before and after lip implant placement in both lips. It is important to remain in a straight line in the center of the lip throughout the entire dissection or the implant will not sit naturally. I generally use a tendon passer to perform the dissection, then pull one end of the implant through the incision, center it and close the incisions. Experienced surgeons can perform this procedure in about 5 minutes. Patients are asked to limit oral function for several days and ice as applied as much as possible. Figure 12 shows a before and after picture of a patient with upper and lower lip implants. For most cosmetic surgeons, injectable fillers can satisfy the majority of their patients. Some patients, however, present with inherited, developmental, or age related lip problems that are not amenable to filler injection. For this population, procedures such as the subcutaneous lip lift, lip reduction and lip implants may have benefit. In today’s fast paced field of cosmetic facial surgery lip enhancement is one of the hottest and most requested options. The most common lip augmentation procedures include injectable fillers, lip implants and unknown to many patients, subcutaneous lip lift. This procedure is also called “subnasal lip lift”. What is a “Lip Lift”? A subcutaneous lip lift is a procedure where excess skin and muscle are removed from the upper lip, just under the nose. This procedure is done for two reasons; first to shorten the aging lip and secondly to roll out the upper lip to provide pout. Young patients have shorter, fuller and more pouty lips and as we age, the lip elongates and loses volume and pout. In addition, upper lip excess can cover the front teeth in some patients giving them a “denture smile” where the teeth are hidden while speaking and smiling. A surgically shortened lip can provide a more youthful and cosmetic show of teeth. Who is a candidate for Lip Lift? This procedure is most commonly performed on patients with an excessively long upper lip from heredity or aging. The lip must be at least 18 mm long from the bottom of the nose for the patient to be a candidate for this procedure. Most patients requesting lip lift are those who are aging and losing normal lip form and function, younger patients with long lips or any patient who has lack of normal incisor (upper teeth) show when smiling or speaking. This procedure is about 30 minutes long and can easily be performed with local anesthesia or IV sedation if the patient wishes. The lip is measured and marked and a “mustache” or Bull Horn” configuration of excess tissue is removed. The can include skin or skin an muscle. The incision is closed with very fine sutures and the patient is asked to refrain from excessive oral function for several days. This must be done in a very precise and controlled way or the procedure will not be effective and the scar will be noticealbe. When performed correctly with normal healing, the procedure heals in about 7-10 days and by 30 days the scar is usually hardly preceptible. If the scar is visible it can easily be lasered to hide it. 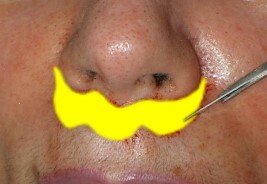 The image below shows the area of skin to be excised in yellow and the right image shows a typical lip lift scar 3 weeks after the procedure. 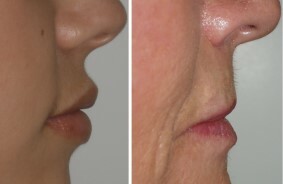 The image below shows a patient before and afer subcutaneous lip lift by Dr. Joe Niamtu. Note the shortened lip with improve pout as well as the increased amount of upper tooth show consistent with a more youthful lip. Recently, new wrinkle filler called Evolence has been getting a lot of attention, especially after Demi Moore and other Hollywood types have admitted using it. This is an exciting time in cosmetic surgery as many new and effective products have become available. As the minimally invasive revolution continues, patients find it difficult to take precious time away from work or play and want significant lasting results with minor recovery. Enter Evolence! Evolence is new to the United States after recent FDA approval, but is the number one filler in Israel and has been used outside of the US for ten years. What sets Evolence apart from other wrinkle fillers is its unique collagen composition. While most of the other popular fillers are made of synthetic substances, Evolence is the first all natural filler. It is made from porcine tendon which has the closest structure to human collagen and has been used for decades in heart valves, skin grafts and other medical and surgical products. Although collagen fillers are not new, they fell out of favor due to two things. One was that patients were allergic to the older bovine collagen fillers. Evolence has a unique proprietary process of removing the allergic components of collagen and no allergy testing is required! This is a huge and new step for injectable collagen fillers. The other drawback of previous collagen fillers was that although they did a good job, they simply did not last. Evolence has a patented Glymatrix technology which is a sophisticated cross linking process that extends the length of the filler for up to or over a year. I can speak personally to this filler. I was chosen to be one of the teaching staff for Evolence and attended an injection training session in January of 2008 in the Cayman Islands. The meeting was off shore as new fillers that are not FDA approved cannot be injected on US soil. The instructors were offered free filler, so I had my smile lines injected. As I type this blog entry it is exactly one year later and my filler is still present. The main difference between Evolence (the new collagen) and other fillers is that Evolence actually becomes part of your tissue. It is collagen and is designed to replace the collagen we lose due to aging. When injected, instead of being recognized as a foreign body (like most fillers) it is recognized as collagen and the body integrates it into the natural surrounding tissue and even grows blood vessels into it. It also causes the body to produce some new collagen which can add to the result. Pretty cool. Perhaps the biggest advantages of Evolence is the fact that since collagen has many special properties, there is less swelling, pain and bruising with Evolence. It is great for the patient who wants treated but has a big party in several days. Right now Evolence is only FDA approved for the nasolabial folds (smile lines) but an new product called Evolence Breeze will be available for lip injections and is used very successfully in other countries. If you are old enough to have filler injections you are probably old enough to remember the scene from the movie “The First Wives Club” where Goldie Hawn gets lip injections and ends up with wickedly gigantic lips. No one can argue that injectable fillers have added immensely to minimally invasive cosmetic facial surgery, but sometimes you can get too much of a good thing! The complications associated with injectable lip and wrinkle fillers are usually pretty benign with under treatment and over treatment being among the most common problems. Frequently, overtreatment is associated with novice injectors or poor technique, but even the most experienced surgeons will occasionally have an overzealous result. There is no doubt that a patient may be disappointed with an under treated area, but they will be livid with an asymmetric or over treated area. Let’s face it, no patient wants to walk around with excess filler in the lip, smile line or under eye area. There are numerous fillers available and each of them has various positive and negative aspects. The most commonly injected fillers are the hyaluronic acid fillers which include Juvederm Ultra and Ultra Plus, Restylane, and Perlane being the most popular. Hyaluronic acid is a naturally occurring sugar that is present in many human tissues, especially the skin. These fillers have been shown to persist in the body for up to a year, which is a good thing if you have the correct amount in the right place. One additional (and I feel a huge advantage) with the hyaluronic acid fillers is the fact that they can be dissolved or reversed with a very predictable, safe and simple treatment that happens almost overnight. Sound too good to be true? It’ a fact. Hyaluronidase is an enzyme that will dissolve hyaluronic acid rapidly and safely. This medication is marketed as Amphidase and is mixed with local anesthesia and injected into the area of excess filler. Almost like magic and almost overnight, the excess filler will dissolve, leaving a happy patient and surgeon. Hyaluronidase has been used by doctors for injections for years, most commonly to assist the spread of local anesthetic solutions. It has an excellent safety record although it is good to perform an immediate skin test and wait 5-10 minutes before treatment. A small bleb of the inner surface of the forearm can be injected to see if it causes any inflammation in the area. Hyaluronidase is used to dissolve excess or unwanted filler by mixing it with local anesthesia and injecting into the area of excess filler. I have personally injected one of my patients and a bunch of patients treated by other surgeons with Hyaluronidase with good results. The excess filler (assuming it is a hyaluronic acid type) dissolves in one or two days and is impressive. Occasionally it is necessary to re treat an area with additional Hyaluronidase if the first injection did not take care of the problem. I have used it to dissolve bumps on the lip, lips that were too big and fat or tear trough areas (the groove under the eye and above the cheek) that were over treated with good results. The above patient was over injected with a filler and was unhappy with the excessive result. She is shown 48 hours after Dr. Niamtu injected hyaluronidase into the area of excess under the eye. The use of Injectable facial fillers is one of the fastest growing areas in the field of cosmetic surgery. Many advances in have been made in the last 5 years that have led to safer, more predictable and longer lasting fillers. Historically, surgeons have injected substances into the face and lips for over a century. For the past 25 years, the choice of FDA approved fillers was very limited and basically was the use of bovine collagen (obtained from cows) products such as Zyplast and Zyderm. While these fillers were effective, they required allergy testing and a one month wait for injection after a negative allergy test. 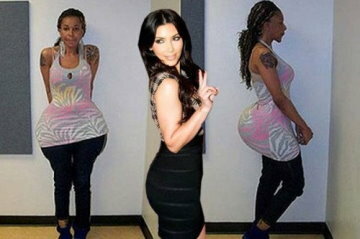 In addition, the did not produce lasting augmentation and the results were often gone at 3 months or less. In December of 2003, the FDA approved Restylane for treating facial folds and wrinkles. Restylane represented a new type of filler and is made from hyaluronic acid which is a naturally occurring carbohydrate that is found in the skin and other tissues of all mammals. This substance is a clear gel with similar consistency as hair gel. Since it is not made from animal products, there is no need for allergy testing which is a huge advantage as the patient can come to an office and have same day filler injection. In addition, the hyaluronic acid fillers have a chemical process known as “cross linking” which prolongs their effect in the body, giving augmentation that can last 8-12 months. Medicis, the company that makes Restylane also has a more robust filler known as Perlane which was FDA approved in 5-07. This is a thicker filler that is used for smile lines (nasolabial folds) and other areas and provides a firmer support and lasts longer than Restylane. Since the FDA approval of Restylane, Allergan Inc. (the makers of Botox) have had 2 injectable fillers approved by the FDA in 2006. Juvederm Ultra is a hyaluronic acid filler similar to Restylane and Juvederm Ultra Plus is a larger particle, more robust filler, similar to Perlane. The hyaluronic acid based fillers (Juvederm and Restylane) currently remain the most popular filler choices. Hylaform, Hylform Plus are animal based hyaluronic acid fillers FDA approved in 2004, formerly marketed by Inamed (now Allergan) that have declined in popularity with the newer non-animal derived hyaluronic acid fillers. Captique (also marketed by Allergan) is an additional non-animal hyaluronic acid filler that was FDA approved in 2004. There is a continued effort to develop longer lasting fillers. Although a permanent filler may sound like a perfect thing, if a patient has complications such as over fill or asymmetry, then permanent may not be a good thing! In experienced hands, the longer lasting fillers work well and their lasting effect is appreciated by both surgeons and patients. There are numerous fillers that claim to last longer than the hyaluronic acid fillers. One of these FDA approved fillers is Radiesse. This filler is made from a substance that has similar properties to the organic matrix in bone or sea coral. These fillers have a consistency similar to tooth paste and due to their composition, can last up to 18 months. Radiesse is most often used in the nasolabial folds and for cheek augmentation, but may be used in the lips by some injectors. Since this is a thicker filler, it is generally used in deeper areas of the skin so there are not irregularities in the superficial skin. Another new, longer lasting filler is Artefil. This filler consists of microscopic plastic beads that look like pearls under a microscope. The beads are mixed in a collagen carrier for injection. Since the beads are plastic, they will remain in place permanently and thus provide a lasting augmentation. One drawback to this filler is that since it contains collagen, it requires allergy testing one month before injection. With the previously described fillers, they work by filling the lip or wrinkle with volume and are gradually digested by the body. Basically, when these fillers are injected, “what you see is what you get”. There exists another class of injectable fillers that work in a different manner than simple augmentation. Silicone and Sculptra work by an alternate method. These fillers are injected into the deeper skin and they cause the body to make new collagen. When these fillers are injected, they cause the collagen reaction that actually causes the area to grow over a 3-4 week period. This means that when Silicone of Sculptra are injected, there may be little noticeable result at first, but over the next month, the body will produce collagen in the injected areas and the augmentation will actually grow. With Silicone, very small micro droplets are injected into the lips or wrinkles and over the next month these tiny droplets of silicone will become surrounded with collagen and enhance the augmentation. Since the Silicone will “grow” it is injected in very small volumes on a monthly basis until the desired result is achieved. Silicone is considered a permanent filler as it stays in place and the body does not digest it. Sculptra is substance known as L-Poly Lactic Acid which is similar to the material used to make a type of suture that is used to close lacerations. This material, similar to Silicone, will cause the body to make new collagen in the area where the filler is injected. Due to this, the reaction (like Silicone) is not immediate but increases over the next 3-4 weeks after injection. Sculptra is popular for injection into the nasolabial folds and for cheek augmentation. Some surgeons may also inject Sculptra in the lips and other regions of the face. Sculptra, like Silicone does not require allergy testing. Since the science of fillers is so prolific, we will see new fillers introduced on a regular basis. In Europe, cosmetic surgeons have over 70 choices of various injectable filler products. Several very recent FDA approved fillers include Evidence, Elevess, and Prevelle. Elvess is a hyaluronic acid filler that contains local anesthetic (0.3% lidocaine) and was FDA approved in 12-07. By combining a local anesthetic with the filler, the injection process is more comfortable for the patient, although most surgeons use local anesthetic injection routinely before filler administration. Prevelle Silk is another hyaluronic acid filler with local anesthesia marketed by Mentor and is representative of the process of adding lidocaine to the actual filler product. Evolence is a filler that is made from porcine collagen (derived from pig tissue) and claims to last up to a year when injected into the nasolabial folds. Evolence has the consistency of a paste, does not require allergy testing and is yet another exciting example of the new generation of fillers. Who is a Candidate for Injectable Fillers? Facial fillers are administered over a wide age range. Younger patients may seek filler injection for lip plumping and fillers are used in the lips and other areas on aging patients. Men are also candidates for injectable fillers and are one of the fastest growing filler patient populations. Since filler injection is basically a simple and safe procedure most patients are candidates for injectable fillers if they want to plump their lips or wrinkles. Fillers should only be injected by appropriately trained personnel that can manage any potential complications. Who is not a Candidate for Injectable Fillers? Patients with significant allergies should check with their doctor before having any filler injected. Also patients taking aspirin or any medication that could affect blood clotting should notify their surgeon prior to injection to avoid hematoma, bleeding or severe bruising. What is the Intended Result of Filler Injection? Fillers are intended to plump lips and soften wrinkles. Different patients have different areas in need of improvement for their lips. Younger patients may only need some slight plumping to augment their already youthful lips while older patients may need plumping, outlining (restoration of the youthful border of the lips) and injection of lipstick lines. For wrinkles and folds, fillers are intended to “soften” the wrinkle or fold, not to eliminate them. It is important that the patient has reasonable expectations prior to the treatment as not to be disappointed. If you consider the wrinkle a depression in the skin, the filler will plump up the depression to make it less severe, but will not make it completely disappear. Having realistic expectations is very important. How Long Can I expect the Filler to Last? Filler longevity is extremely variable and depends upon the type of filler used, the area it was placed and the metabolism of the individual patient. Fillers generally do not last as long in areas of extreme movement such as the lips as compared to less mobile areas like the cheekbones. How is the filler administered? Every surgeon has a different way of injection filler. Most surgeons will use a topical anesthetic cream and also administer local anesthetic injections (dental injections) prior to injecting fillers. Ice is also applied before and after injection. Injection generally only takes several minutes and some fillers cause immediate swelling so the patient may appear “over treated” at first. This swelling generally resolves in several hours. A follow up appointment several weeks after filler injection is a good idea so the surgeon can evaluate the result and touch up any areas in need. What is the Recovery for Filler Injection? For most patients, fillers can be injected in the lips or wrinkles and they can return to work the next day. Occasionally some patients will swell dramatically, especially in the lips, so for a first time patient; they may want to schedule the initial injection on a Friday. Occasionally patients will bruise from lip or wrinkle filling and this can usually be covered with makeup, but it is a good idea not to schedule filler injection right before an important social function in the event the patient experiences unusual bruising. What are the Possible Complications of Injectable Filler Injection? Like any procedure, filler injection can cause complications, but fortunately they are generally rare and minor. The most common post injection complications are swelling and bruising, both of which generally are short lived and self limiting. Over correction or under correction are also possible. For under correction, more filler can be added. In cases of over correction, sometimes the excess filler can be expressed out of the lip or wrinkle through a small needle puncture. Hyaluronidase is a medication that will dissolve the hyaluronic acid fillers and can be used to reduce areas of over treatment. Asymmetry is another possible complication where one side may be different from the other and again, requires filling of the deficient side. In rare case allergic or foreign body reactions have been known to occur with fillers, but this is extremely rare. All of the above potential complications should be thoroughly discussed with your doctor before injecting fillers. Injectable facial fillers have broadened the scope of minimally invasive cosmetic facial surgery and provided increased rejuvenative options for both doctors and patients. The represent an exciting and rapidly expanding part of anti-aging treatment and hold much promise for new fillers on the horizon. What used to require surgery can now, oftentimes be accomplished in several minutes with minimally invasive injectable facial fillers. If you asked a doctor about injectable fillers 20 years ago, the answer would have been easy…..collagen. Bovine collagen (from cows) was about the only FDA choice for plumping lips and wrinkles. It worked pretty well, didn’t last very long and required allergy testing a month before injection. Hard to believe that surgeons and patients put up with it for so long! Meanwhile, overseas, many filler options were popular. In about 2002 Restylane was given FDA approval and started the filler revolution in the USA. Restylane (a filler made by Medicis) is a sugar derivative that is called hyaluronic acid and is found naturally in many body tissues. Since it is a non animal product, no allergy testing is necessary and this option ushered in the new age of fillers. Medicis also has FDA approval for Perlane which is a thicker, longer lasting and more robust hyaluronic acid filler. Restylane pretty much owned the filler market until Allergan obtained FDA approval for Juvederm. Juvederm Ultra is another hyaluronic acid filler and is currently giving Restylane a run for its money. Many people feel that Juvederm is easier to inject, hurts less, is softer feeling and lasts longer. Others feel that it is very similar to Restylane, like Coke is to Pepsi. Personally, I use both depending upon whom and where I am injecting the filler. In some respects I am a filler “bartender” as I offer many brands of fillers for different applications and patients. Allergan also sells Juvederm Ultra Plus, which like Perlane is a thicker (larger particle) filler. These more robust fillers usually last longer and are more frequently used in deeper folds or wrinkles, but they can also be used in the lips. The hyaluronic acid fillers constitute 90% of my filler practice. These fillers generally last 6-12 months, depending upon on the patient’s metabolism and where they are injected. Areas like the lips which are continually moving to not last as long when filled as less mobile areas such as the cheekbone regions. Although bovine collagen (Zyplast and Zyderm) have largely fallen out of popularity, Allergan offers human collagen fillers called Cosmoplast and Cosmoderm. These fillers are not quite as popular as the hyaluronic acid fillers and do not last as long. They are very forgiving and work well for fine lines and lipstick lines. I only use these fillers when a patient requests them. Radiesse is popular filler that is made from synthetic calcium which is similar to a ground up bone paste with the consistency of tooth paste. This filler is more for deeper folds or wrinkles and I do not use it in the lips. Radiesse is popular for smile lines (nasolabial folds) or cheek plumping. The advantage of Radiesse is that it lasts for up to 18 months. Sculptra is synthetic filler that is FDA accepted for facial filling in HIV patients. It is also used for cosmetic applications. This filler is injected and stimulates the body’s collagen to increase, which contributes to the filling. I have used Sculptra and see no significant advantage over the hyaluronic acid fillers such as Juvederm Ultra or Restylane, although some of my colleagues favor it. Permanent fillers exist and this can be good or bad. If the treatment result is positive and if the patient likes it, being permanent is a positive thing, but if there is a treatment problem or the patient does not like it, there can be big problems. Liquid Silicone (Silikon 1000) is permanent filler. In the past silicone has gotten a bad rap because surgeons were injecting non medical grade silicone into the body and it caused many problems. In addition they were injecting large amounts of silicone at a single treatment. Silicone is actually a very naturally feeling and safe filler and I use it for lips, wrinkles folds and acne scars on patients with whom I am well acquainted and have experienced resorbable fillers (those that go away) in the past. Silicone has been safely used for 50 years, and when using medical grade silicone (which is FDA approved) with the proper technique, it is safe, natural feeling and predictable. The key to successful silicone injection is called the micro drop technique. In this technique, extremely tiny drops of silicone (smaller than a pin head) are injected. The volume may be so small that it is not very noticeable on the first treatment. When the small droplets of silicone are injected, the body will surround them with the patient’s natural collagen. This causes an increase in the tissue and produces bigger lips or fills wrinkles. Silicone is generally injected on a monthly basis until the desired effect is almost reached (since the silicone will grow after the last injection). After this, touch up injections may be done once a year. The results of silicone injection last for many years and should only be given by experienced injectors. Artefill is the newest permanent filler to obtain FDA approval. In February of 2008, I injected the first Artefill patient in Richmond, Virginia. This filler contains microscopic plastic beads that fill the wrinkles and like silicone, stimulate the body’s collagen to increase the filling. Since the beads are permanent, the result can last for many years, which is a good thing if it is done correctly. I use Artefill on the smile lines for patients that request it or desire a permanent option. Since this filler also contains animal collagen, the patient must be allergy tested a month before treatment. This is a bit of a drawback. Human fat is also a filler option and although I used to perform a lot of fat transfer, I do it much less since the availability of new fillers. 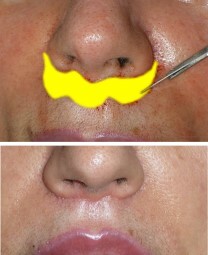 In fat transfer, I harvest fat from around the belly button and inject it in the lips and face. Fat is nice because it is the patient’s own tissue but in my experience, most of it gets dissolved with time and it requires several injection sessions to achieve a lasting result. Another drawback of fat injection is that the area must be over corrected since much of the injected fat will go away. Due to this, patients will have an extended recovery until the over correction adjusts. The above descriptions don’t cover every single filler but is a synopsis of the most common available FDA fillers in this country. Each year new fillers will be introduced. I recently went to the Cayman Islands to become certified as a trainer and inject a new filler called Evolance (made by Johnson & Johnson). This will also be promising filler once the FDA approves it for use in this country, which will be soon. Since every patient is different and every area is also different, many options occur for plumping the lips and filling out wrinkles and scars. Experienced injectors should be able to guide the patient to the best filler for their particular needs. To find out more about injectable click the link below. Lip implants are also an option for permanent lip filling and will be discussed in a future blog entry. To learn more about lip fillers select the following link.